Your baby’s skin is very delicate and a lot more sensitive than an adults, which means that it requires lots of special attention from you. The skin is the body’s largest organ, and whatever we put onto it is absorbed by the body- and for babies this happens a lot quicker too. Your baby’s skin is also a lot thinner than yours, which is why it needs to be treated with care, and why what you put onto it needs to be closely scrutinised. Throughout the cold winter months, the skin can take a battering in terms of temperature changes and adverse weather- and this goes for babies too! 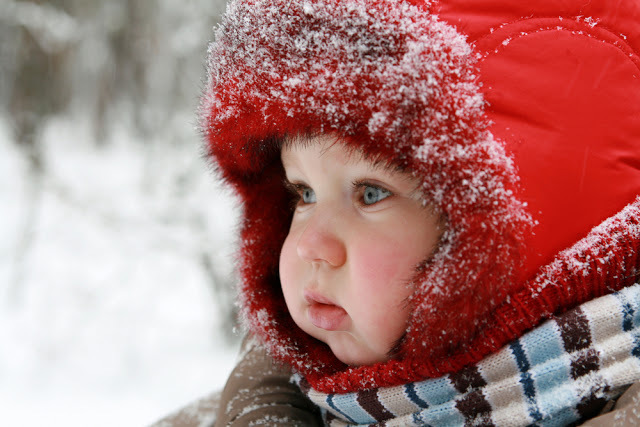 Here is a quick guide to caring for baby’s skin in the winter. Before you leave the house, make sure that you prepare your baby’s skin for the weather outside. Cold winds, rain and icy weather can not only make us feel cold, but can have an affect on the skin too. Babies are extra sensitive to changing temperatures, so you also need to take care not to let baby get too cold or too hot. Wrap up warm to leave the house, but make sure you remove the extra layers as soon as you come inside. Another good tip before you go out is to make sure your baby is dressed in breathable layers, which will defend against heat rash. In the winter months it is still possible for babies to suffer from this when they are bundled up warmly to protect against the cold! It might also be a good idea to apply some balm to baby’s lips to protect them from chapping. With the cold weather and a baby’s tendency to drool and dribble, chapped lips are often the number one cause of upset for babies in winter- and it’s something that’s easily resolved. It’s also a good idea to use a rain cover on your pram (if you aren’t carrying baby in a sling/ carrier) and don’t forget the hats and gloves too. Babies lose lots of heat from their hands and skin on the hands can become very sore in cold weather. Lastly, make sure you apply a good but delicate moisturiser to baby’s face before you leave the house. This will help to protect against biting winds and cooler temperatures, because it helps the skin to stay hydrated, making it less susceptible to chapping. Use only natural ingredients on your baby’s skin and lips as chemicals can not only cause adverse reactions, but are less likely to protect against the elements. Bath time is an excellent opportunity to reinforce your baby’s skin care routine, and this is ever more important in the winter months. Don’t skip bath time; allow your baby to splash in the warm water, and follow it with a soothing baby massage to help relax and soothe sore skin. Use a warmed (in your hands) massage oil to moisturise baby’s skin and as you relax and bond, you are providing your baby’s skin with extra protection against the cold weather outside. Remember that cold air carries less moisture than warm air, so you may need to moisturise your baby’s skin a little more often. ● frost bite: make sure baby wears gloves or mittens and it goes without saying that feet need to be covered too! In extremely cold weather babies can be more susceptible to frost bite so keep outings short if you can, and take extra care to shelter from icy winds. ● snow burn: did you know that snow can reflect the sunlight and cause sunburn? Take care to protect baby’s skin as you would in summer. Of course, whatever you put onto your baby’s skin will be absorbed by the body so it’s important to pay attention to what you use. Look for natural and organic ingredients when you buy baby’s toiletries, and pay special attention to the labels in case there are hidden chemicals in there. If you are at all concerned, do speak to your doctor for further advice. Don’t forget that your baby does not need to bath every single day, especially if she suffers from skin conditions that worsen in the winter. Always pat skin dry and apply moisturiser is gentle downwards strokes. It’s a good idea to make sure that clothing is soft too, and only use non-biological washing detergents.